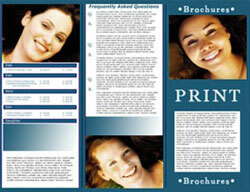 8-1/2 x 14 – Brochures can be left unfolded, be bi-fold, tri-fold, or quad-folded. Colors can print 4/0, 4/1, 4/2, 4/4. A variety of coating options are available.